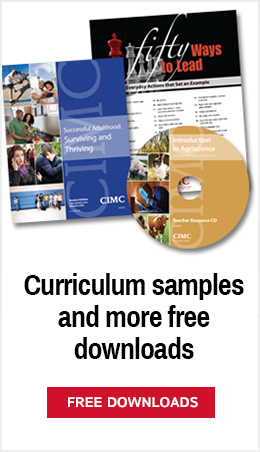 We think you'll like our curriculum products, and it's important to us that you are happy with your purchase. That's because if you're satisfied, you'll be much more likely to try our other products! Why don't we offer free previews? Yes, we realize that some of the commercial publishers offer you a preview copy. Unfortunately, because we're a state agency, our budget does not allow us to do that. However, once you've purchased your curriculum, if you are not completely satisfied, we do want you to return it. Make sure you include your shipping ticket or invoice number, so we can credit your account. We'd love to know why you're not happy. If you tell us why you're returning the product, we can use that information to improve our products. We want to offer our customers the most current, valid information available, so we update our materials periodically. Sorry, but we can't take back the previous edition when a new edition becomes available. Of course, we do hope you'll want to purchase the updates! Just like our commercial counterparts, all CIMC materials are copyrighted. That means they can't be copied unless it specifically says so on the material. We realize that by packaging some of our materials in a loose-leaf format they would be easy to photocopy, but please do not copy them and then return the originals to us. Please note that our return policy does not include CD and video products. In the event these guidelines are not followed, materials will be returned to the customer at the customer's expense. Contact our Customer Service staff at 800.654.4502 or email us.